The CT 60 Length Gauge features a measuring range of 60�mm. It is used for incorporation into special measuring apparatus, calibrating and inspecting devices or special purpose machines, for example in conjunction with the monitoring and control of assembly and adjustment procedures. The total error of the CT 60 over the entire measuring range of 60 mm lies within ��0.1��m at ambient temperatures between 19 and 21 �C and with temperature fluctuations of � 0.1 K during measurement. When the CERTO is used with length error compensation, e.g., in conjunction with the ND 281 Display Unit, HEIDENHAIN guarantees atotal error of � 0.05 �m over the 60 mm measuring range. The CT 25 Length Gauge features a measuring range of 25�mm. The high accuracy and measuring steps of 10 nm and less permit use of the CT 25 in gauge block calibration. Thanks to its generous measuring range � much larger than with inductive length gauges � the number of reference standard blocks required can be reduced significantly. The total error of the CT�25 over the entire measuring range of 25 mm lies within ��0.1��m at ambient temperatures between 19 and 21 �C and with temperature fluctuations of � 0.1 K during measurement. When the CERTO is used with length error compensation, e.g., in conjunction with the ND 281 Display Unit, HEIDENHAIN guarantees atotal error of � 0.03 �m over the 25 mm measuring range. Campbell, CA, August 3, 2005 FRT of America, LLC today introduced an extension of it's MicroProf TTV Series optical profilers, specifically developed to measure through semiconductor Blue tape and other transmissive tapes. While it is widely known in Europe that FRT has been measuring topography through other transparent materials since 1998, colored transparent materials add several new problems to the equation. The new Through Transmissive Mode (TTM) mode, which recently has been adopted by several leading semiconductor companies, enables high-resolution, non-contact measurement of samples through protective tape backing allowing, absolute difference between maximum and minimum thickness of a test sample encountered during a thickness scan or series of point thickness measurements; sometimes called Total Thickness Variation, TTV to be accurately measured through the tape. "Measurement through dicing tape adds an important level of capability to our Micro Prof Series TTV optical profilers," said Trevor Bacolini, Fellow, and head of FRT's Industrial Metrology Applications group. "Optical profiling has demonstrated significant benefits for wafer thinning development and for quality control throughout the Wafer manufacturing process. This new, FRT-exclusive technology lets developers quantify the performance of devices in their final, frame diced state or at the wafer level and wafer mounted to glass inspection as well adding an additional level of security for path finding tools for detection of various process variances encountered in the development of wafer process tooling. "The new TTM technology also lets process engineers view various wafer substrates as they react to applied changes in temperature, pressure, humidity, etc., within laboratory, test floor and fab conditions. The ability to view such effects quickly, and at nanometer-scale resolution, opens numerous doors for research and process development to modify wafer thinning recipes on the fly." 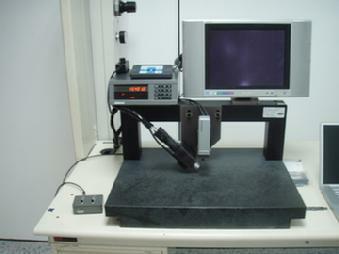 The Technology -CWL (Chromatic White Light) is a standard technique for non-contact, 3D measurement of surface topography at the micro- and nano-scales. The additional TTV capability allows FRT, Microprof Series optical profilers to characterize samples through up to 1 mm of blue tape, or other transmissive media. FRT�s line of chromatic probes based on white light confocal technology. The use of chromatic "splitting" allows for sub-division of the white light spectrum to correspond to unique Z-axis displacement levels. Each wavelength will be perfectly focused at a different Z height using the confocal principle, all out of focus light is rejected resulting in only the in-focus point been registered. The use of monochromatic wavelengths to discern Z height eliminates the need for moving components in the sensor resulting in a robust extremely accurate solution.The modularity of the sensors also allows users to compensate for different transmissive materials and thicknesses, for greater flexibility. Since there are no objectives in the probe, the tool can easily handle long profiles greater than 300mm with 10nm resolution in Z as well as 3D 50mm by 50mm singles scans with 1um lateral resolution, well beyond the capability of any microscope field of view limited system. Metrology for MEMS/SU-8 Manufacturing Optical profiling has proved to be the most versatile measurement technology for MEMS development and for control over utlra thick and thin film micromachining processes. We build inline and automated metrology solutions for the following MEMS processes. � Precision backside mask aligners � Wafer double-side resist coaters � Deep reactive ion etchers � Highly integrated MEMS process cluster tools  Our metrology tools are available to support not only fundamental R&D, but also high-volume production of silicon micromachined products as the need arises. SVMS is pleased to announce a new line of probe related microscopes and optics. These units were designed with the intention of replacing Mitutoyo's exisitng probe units. These units are competively priced and have several significant advancements including parcentricity and parfocality for every objective. The Critical Dimension CD option is used mainly in conjunction with the MFE series, i.e., for applications in the clean room or in the front end area. Typical here would be measuring structures on semiconductor wafers or on masks. .
All the sensors from SVMS are also available as OEM sensors for use in other instrumentation. For additional information, please contact us. The non contact, chromatic white light sensor measures the surface of an object with high resolution and accuracy. The sensor works on virtually any surface, regardless of the reflectivity, roughness or color. The very small light spot enables very high resolution. By using various measuring heads, a height resolution in the nanometer range and measuring ranges of several millimeters can be achieved. The measurement is made coaxially to avoid shadowing effects caused when the illumination and measuring directions are not the same. The basic principle is point distance measurement using white light. In contrast to conventional optical sensors, chromatic distance measurement is performed without moving parts, i.e., wear-free. This prevents measuring errors such as can occur due to settling times in systems using auto focus lenses. The chromatic sensor thus not only features all the outstanding specifications of a laboratory instrument, but is also rugged enough for production use under difficult ambient and environmental conditions. The passive measuring head is connected to the electronics unit via an optical fiber and can therefore be operated at a distance of several meters from the sensor electronics. The CWL is based on the principle of chromatic distance measurement. White light is focused on the surface by a measuring head with a strongly wavelength-dependent focal length. The spectrum of the light scattered at the surface shows a peak in the spectrometer, with the wavelength of this peak used to determine the height on the sample. The sensor works on transparent, highly reflective or even black surfaces. It is extremely fast and has virtually no edge effects. The chromatic sensor has a liquid crystal display for displaying the current measured value, as well as buttons for fully configuring the sensor. This allows the sensor to be used for stand-along applications. Two configurable analog outputs enable you, for example to output the current measured value and the signal strength as a voltage between 0 and 10 V. For systems integration, an RS232 port is provided. This serial connection can be used to read measured data and/or to configure the sensor. Typical applications include highly resolved position monitoring, wear measurements and runout measurements. In the MicroProf® and MicroGlider® instruments the sensor is used for high-resolution and accurate profile, topography and roughness measurements. Flexible measurement along individual profile lines or by using a raster scan, a complete 3D surface measurement can be performed. The measuring range can be user selected. The FRT AFL operates on the principle of dynamic focusing. Here the sensor lens is brought up to the target until the measuring spot is focused on the surface. When a surface is scanned, the lens is moved as the measuring spot follows the object height. The change in lens position, which can be measured to high accuracy, is used to determine the surface height. The sensor is equipped with an integrated microscope, which simplifies the selection of the target position and allows it to be observed during the measurement. Together with the FRT MicroProf® and MicroGlider® instruments the sensor is used to measure roughness, contour and topography. Any kind of profile or 3D surface measurements can be performed. The confocal sensor is used for non-contact measurement of engineering surfaces. The sensor works with virtually any material and a broad range of surface characteristics. Thanks to its high dynamics, even weakly reflecting surfaces can be recorded at full measuring speed. The measuring speed is also independent of the surface structuring. Settling phenomena such as are common when measuring steep edges with auto focus sensors are eliminated with this sensor. The CFP is a confocal laser point sensor. During the measurement the sensor’s objective lens oscillates as it focuses a laser beam on the target object, with the position of the light spot changing accordingly. When the focus is exactly on the target, the sensor captures a maximum of the light scattered at the surface. The position of the objective lens, which is measured with high precision during the oscillation, is used to derive the target height. The confocal sensor is suitable for both laboratory and production use. Position monitoring or runout inspection are typical applications. In raster scan measuring systems the sensor is used as a cost-effective alternative for topography or profile measurements when a large measuring range is important and height resolution is less critical. The actual measured value and light intensity of the processed signal are converted into an analog voltage and brought out to the output terminal. The CFP is used in the MicroProf® and MicroGlider® instruments. The conoscopic sensor is used for non-contact measurement of engineering surfaces. It is compatible with strongly absorbing as well as reflecting materials. Heavily structured, rough or even smooth (but not mirroring) surfaces can be detected. The measurement is coaxial, which eliminates shadowing effects even on heavily structured parts. The CSL is a laser point sensor. The FRT CSL features a large working distance, a high measuring range as well as the ability to measure strongly tilted surfaces. These characteristics make the sensor ideal for measuring objects with steep edges (e.g., tooth gears) and for inspecting blind holes or inaccessible locations, which can only be sensed from a greater distance. This sensor is not suitable for roughness measurements. In conoscopic distance measurement, a laser beam is directed at the target. The light scattered at the surface, and detected by the sensing head passes through a birefringent crystal. Due to the differing propagation speeds of the ordinary and extraordinary rays, two wave fronts are received which interfere on an analyzer. The distance to the target is derived from the interference pattern. The measured data can be made available on an analog output and sent to the PC through the printer port. The included WindowsRM software allows you to calibrate the sensor and display the actual measured value. The required WindowsTM drivers for integrating the sensor into an existing measuring system are also included. The CSL is used in the MicroProf® and MicroGlider® instruments. The triangulation sensor is a cost-effective solution for non-contact and fast distance measurements. It works with both weakly and strongly reflecting surfaces. Matte, rough or smooth (but not mirroring) surfaces can be sensed. The measuring spot is very small for a triangulation sensor, and allows it to be used for topographic measurements with high local resolution. The TAL is a laser point sensor. The use of double triangulation effectively suppresses or eliminates the usual effects of multiple reflections and shadowing on steep edges. Double triangulation also ensures the highest possible resolution. Typical applications for the FRT TAL include position and distance monitoring, measuring of runout or imbalance or, when two sensors are used, for checking sheet metal thickness (TTV total thickness variation). The high sampling rate makes the sensor ideal also for oscillation measurements. In the FRT MicroProf® Junior, the triangulation sensor is used for recording profiles and topographies of engineering surfaces by rastering the sample. The measured value is made available on an analog output in the form of a voltage between -10V and +10 V.
The fringe projection sensor is used for high-resolution, rapid surface measurements. The sensor is suitable for highly reflecting metal surfaces as well as black plastics. Rough, clefted surfaces can be measured as well as very smooth (but not mirroring) objects. The topography of a complete surface section can be captured in just a few seconds without having to move either the sensor or the part. This sensor is not suitable for roughness measurements. In fringe projection, a sequence of variously fine fringe patterns is projected on to the specimen. When viewing this pattern at a certain angle to the projection direction, the change in object height results in a distortion of the fringe pattern. The sensor uses this principle to calculate the topography of the specimen. The FRT FPM is used with a digital micro-mirror array. This ensures a short measuring time, high fringe contrast, distortion-free projection and therefore highly precise and rapid surface measurements with high resolution. The FPM is used with the MicroProf®, MicroGlider® and MicroSpy® instruments. When used with the MicroProf® and MicroGlider®, image stitching can be employed to cover large sample areas. Of all the optical sensors used in non-contact measurement of engineering surfaces, the white light interferometer offers the best height resolution. Smooth, mirroring surfaces can be measured with the white light interferometer as easily and precisely as rough samples. The basic principle is area measurement using white light. The white light interferometer consists of an optical microscope fitted with a camera, whereby the objective lens is replaced by an interference objective lens. The spectral bandwidth of the light source can by restricted by means of filters. The reflected light wave reflected from the specimen is superimposed at the camera surface on a reference wave generated in the interferometer objective lens. Only when both waves show nearly the same wavelengths is an interference created in the camera. In the case of a structured surface, this happens only for point objects which are located within a strongly restricted height layer. As the sensor distance changes, this height layer shifts through the sample. A sequence of individual layer measurements is used to obtain the complete topography. The FRT WLI has two operating modes: used as a classical white light interferometer, measurements on rough surfaces and larger structures (e.g., step height of up to approx. 170 µm) can be captured. In quasi-monochromatic mode the device works like a phase shift interferometer for topography measurements on very smooth surfaces at extremely high resolution. Height differences of as little as one quarter of the light wavelength can be detected. Interference objective lenses with various magnifications are available for a variety of applications. The WLI is used with the MicroProf® and MicroGlider® or as a stand-along device. The confocal microscope is used for rapid, non-contact inspection of the micro-geometry of engineering surfaces such as IC’s or MEMs. The CFM permits surface measurements with the highest resolution both laterally and vertically. The method is area measurement. The confocal microscope is characterized by a high degree of light efficiency. This not only makes it possible to measure high reflecting, smooth surfaces, but also allows the topography of weakly reflecting, highly structured samples to be recorded. The confocal microscope is a high-performance instrument for profile and topography measurement in R&D as well as quality assurance, and its rugged construction makes it ideal for production/manufacturing applications. Topography measurement with the CFM is based on confocal imaging of the surface, which is used to achieve extremely high depth resolution. A camera which images an area of the sample always captures just a thin height layer of the topography. By moving the sensor, all the height layers of the surface are captured in sequence, resulting in a complete topography. The confocal microscope is equipped with various objective lenses. The user determines the field and resolution by selecting an appropriate magnification. Measuring areas which exceed the field size of the objective lens can be handled in the MicroProf® and MicroGlider® by means of stitching, whereby the results of multiple single measurements are stitched together. FRT also offers the CFM as a stand-alone device. The chromatic layer/film thickness sensor can be used to measure thicknesses of transparent materials. Measurements down to a few mm are possible with high resolution. The optical head uses a small measuring spot, so that in a rastering system, layer thicknesses can be recorded with high spatial resolution. Layer thickness measurement is based on the spectral evaluation of the overlapping of the partial waves reflected at the border areas of a layer. At a given layer thickness and refractive index, the intensity of the overlapped partial beams varies with the wavelength. The spectrum then shows a typical waviness from which the layer thickness is determined. In a multi-layer system individual layers can be selected in this way. The small head and the sensor electronics are connected to each other via an optical fiber, so that measuring points can be captured even at a great distance from the sensor electronics. The sensor electronics includes a liquid crystal display, which indicates the current measured value as well as a function keypad for fully configuring the FRT CWL FT. This also makes it possible to use the sensor for stand-alone applications, such as in-process film thickness monitoring, or point varnish thickness measurements. Two configurable analog outputs provide the current measured value and the signal strength as a voltage between 0 and 10 V. An RS232 port is provided for connecting to a PC. This serial line can be used to read measured data and to configure the sensor. The CWL FT layer thickness sensor and the CWL sensor for chromatic white light measurement (see previous) are used together with the same sensor electronics. A sensor electronics unit equipped with the corresponding software and both measuring heads can be used alternately for layer thickness and distance measurement. In the FRT instrument the point sensor is configured in the software. The sample is scanned and the spatially resolved layer thickness distribution measured. The sensor is ideal for fast measurements on layers > 2 µm, and in particular for mapping such layer thicknesses. For accurate measurement of thin layers starting at 10 nm, FRT offers the FTR reflectometric layer thickness sensor, and for even thinner layers the FTE ellipsometer. Producing extremely thin layers is an increasingly important task in many high-tech sectors such as semiconductor manufacturing or in the optical industry. Accordingly, precise measurement and monitoring of the thickness of these layers is taking on increased significance. The sensitive layers require a non-contact measuring procedure. The thin layer sensor is used for such applications. The FRT FTR is based on the principle of spectrally resolved reflection measurement. White light falling vertical to the layer to be measured is partially reflected at the interfaces. The partial waves are captured by the measuring head and sent to a spectrometer. The spectra of the partial waves interfere on the detector array. Depending on the wavelength of the light, the layer thickness and the refractive index, the phase between the partial rays and therefore the intensity of the interference signal changes. The spectrum shows a typical waviness, and if the refractive index is known the layer thickness can be determined. Fourier analysis, which is usually employed to evaluate thick layers, will not work at layer thicknesses of a few mm and under. Here the layer thickness is determined by fitting a test function to the measured reflection spectrum. The spectral characteristic of the refractive index and the extinction coefficient of layer and substrate must also be taken into consideration in order to avoid measuring errors. A user-friendly, Windows™-compatible measuring software package is included with the thin layer sensor. The program reads the measured data from the sensor through an RS232 or USB port. The program includes a comprehensive database which can be easily expanded by the user, and which includes the refractive index and extinction coefficient for a variety of semiconductors, oxides, glasses, metals, resists, etc. The materials database is used to create recipes for each measuring task (for example, SiO2 layer on Si substrate) used as the basis for the curve fit. This is how the extraordinarily high resolution and accurate measurement is achieved. The FTR is used as the sensor in the MicroProf® and MicroGlider® instruments for layer thickness mapping. Pre-defined positions can be returned to with high repeat accuracy. The FRT FTE is used for non-destructive, non-contact analysis of thin layers. Here the word analysis includes not only the high-resolution and precise measurement of layer thickness in the 1 nm to 5 mm range, but also determination of the refractive index and extinction coefficient of the layer material. Surfaces, individual layers as well as layer systems can be studied. In contrast to ellipsometers which only measure at one or two to three discrete wavelengths, the FRT FTE ellipsometer works with a broadband light source and a spectrometer. This means refractive index and extinction coefficient can be determined not only at a few discrete wavelengths, but for the complete spectrum of visible light. In contrast to reflectrometry , in ellipsometry the light beam strikes the layer in question not vertically but rather an angle of 70° from the perpendicular. When there is reflection at the layer or on the surface, the polarization of the linear polarized impinging light changes. This change in the polarization, which is recorded at all wavelengths of the spectrum used, is used to obtain the layer thickness as well as the dispersion of refractive index and extinction coefficient. The user-friendly measuring software and ease of sample handling ensure highly precise and reliable thin layer analysis. When used in FRT instruments, the FTE can be easily combined with topography sensors such as the CWL series. The scattered light sensor is designed for surface characterization studies that are impossible with other optical measuring techniques. The sensor does not directly sense the topography of a sample, but rather uses angle resolution to sense the light scattered on the sample. The operating principle is point measurement using laser light. Angle-resolved stray light measurement allows surfaces to be classified according to their roughness. On very smooth surfaces the sensor can determine root mean square roughness values of Rq < 1nm. A further application of stray light measurement is particle and defect detection. Particles or scratches and holes on an otherwise smooth surface have a strong effect on the stray light distribution and can be detected with very high sensitivity by the stray light sensor. Using a measuring spot of 20 mm, particles with a diameter of 100 nm can be reliably detected. The FRT SLL uses a polar photodiode array as the detector, whereby each detector element is calibrated individually with an intensity range of 120 dB. Measuring frequencies of up to 200 Hz are achieved. The sensor works with no moving components. Once set to an angle area, it allows the complete stray light distribution to be captured in one measurement. The stray light sensor must be operated in a light-tight enclosure to keep out ambient light. FRT uses this sensor in the MicroSpy®, MicroProf® and MicroGlider®. The Atomic force Microscope (AFM) is a head with which one can investigate samples with the highest of resolution. Various local properties can be measured using various measuring modes – with a probe or “tip” placed very close to or on the sample. Various tips (“cantilevers”) are available depending on the task at hand (see “Add-ons”). In contrast to the other sensors, the AFM when used in FRT instruments does not use the XY-table of the instrument to raster-scan the sample, but rather uses a piezo-scanner with electronic linearization, which allows spatial resolutions down to the sub-micron range. Three different measuring heads are currently available which differ in their maximum possible measuring range. The AFM can be installed on the MicroGlider® or MicroProf® next to the optical sensor, so that a sample can be alternately studied with both sensors. Changing the measuring position between the sensors is made quite easy, since the system knows the offset between the AFM and the optical sensor. This ensures that a measuring point can be located in the AFM at any time. This is otherwise a great problem with conventional AFMs. After positioning the sample with the XY-table, the table is deactivated to allow disturbance-free measurements with the AFM. The AFM is then advanced to the sample fully automatically. Data recording with the AFM is controlled using a user-friendly program running under Windows™. The basic configuration of the AFM uses „contact mode“, whereby the tip is dragged over the sample with constant extension (i.e., constant force). An optical interferometer is used to measure the deflection. „Non-contact mode“: The AFM derives topographic images from measurements of attractive forces; the tip does not touch the sample. In addition, the phase relation between the excitation oscillation and the actual oscillation provides information about the sample. „Magnetic/electrostatic force“: Here special tips can be used to measure magnetic or electrostatic forces on the sample. „Elasticity mode“: Measures the mutual interaction between the sample and tip as a function of distance. „Friction mode“: Allows recording of the lateral forces (frictional forces) by evaluating the lateral movement of the tip during the measurement. For especially high accuracy requirements when measuring height, a head with an additional measuring system for linearizing the Z-axis is also available. For special applications the AFM is also available in a watertight, so-called „liquid-compatible“ version. This allows AFM measurements even in water and watery solutions. The atomic force acoustic force microscope (AFAM) is used for determining elastic properties of the sample. The high spatial resolution allows very small irregularities in the material or thin layers on the surface of the sample to be studied which are not accessible to macroscopic elasticity measurements. During the measurement the sample is coupled to the piezoelectric transducer. It emits acoustic waves into the sample, which cause out-of-plane vibrations of the sample surface. The surface vibrations are transmitted into the cantilever via the sensor tip to reveal the sample surface elasticity distribution. The eddy current sensor allows the electrical and magnetic properties of the sample surface to be measured. This distinguishes it from other sensors used to measure the topography of the sample. During the measurement, the miniature eddy current coil is used to generate a magnetic alternating field. The magnetic field exits from a very narrow gap on the underside of the sensor and can be affected by the sample. These variations in the magnetic field caused by the sample itself are registered by the electronics and used as the measurement signal. By using a multi-channel configuration the eddy current signal can be recorded at up to four measuring frequencies at one time. By correlating the measured values, one can measure the layer thickness of electrically conducting or magnetic thin layers or measure non-conducting thin layers on a conducting or magnetic substrate. The Indenter is used to measure force-indentation curves and the Young’s Modulus of samples where macroscopic hardness measurement is not practical. This makes it especially suitable for structured samples and for thin layer systems where only a minimal indentation depth is permitted to avoid spurious effects from deeper lying layers. As an add-on for the MicroGlider® and MicroProf® the Indenter is attached to its own drive. The location to be studied can be set using the optical sensor or CCD camera on the measuring system. The Indenter is then positioned and brought into place for the measurement.